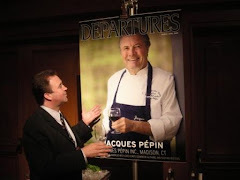 Kevin Fortun founded StockPot in 1981 after working as the purchasing director for Bellevue, Washington-based Schwartz Brothers Restaurants. While working at Schwarz Brothers, Fortun noticed that the group's 15 different restaurants often experienced variances in the quality and consistency of items made from scratch. So Fortun set out to find a line of premium quality soups that could deliver consistent, made-from-scratch taste at each restaurant every time. Fortun decided there must be a market for a line of fresh-refrigerated premium quality soups. With a dream and $50,000 in capital, Fortun launched StockPot®...and Schwartz Brothers Restaurants was his first customer. A spirited entrepreneur, Fortun's vision was a compelling one. He was determined to build a company that could provide foodservice operators with fresh-refrigerated soups that had made-from-scratch taste and appearance. 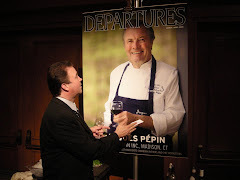 He consulted with chefs, located suppliers of high-quality ingredients and used a network of restaurateurs to gauge market potential. 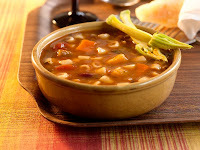 After Fortun sampled his new recipes with his friends, StockPot®'s first line of fresh-refrigerated soups was introduced. StockPot quickly gained a reputation for next-to-scratch quality by using local produce, premium meats and seafoods, proprietary seasoning blends and authentic recipes. Finally, foodservice operators could serve kettle-cooked soups prepared with the same ingredients they used in their own kitchens and at a price competitive with lower quality frozen soups. After "four years of total hell and losing money," Fortun had finally built the network of customers and distributors he needed. In 1984 sales reached $330,000 and his brothers Mike and Steve joined the endeavor. Together, the brothers worked to broaden StockPot's customer base. Soon they had a national foodservice account and a distribution network that included TGI Friday's®, Claim Jumper Restaurants, and a few international clients. US Foodservice San Francisco now stocks 12 Stockpot items including one organic and three vegetarian. 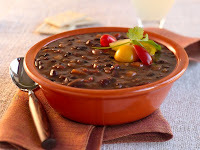 Thick and hearty, this vegetarian chili starts with four beans: black, pinto, kidney, and garbanzo. We add diced tomatoes, red bell peppers, zucchini, and green chiles, and then finish with a sassy blend of jalapeño, cilantro, and smoky chipotle. This authentic Vietnamese pho broth is made with a flavorful vegetable stock infused with star anise, ginger, and traditional spice. 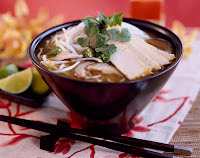 All you need to complete this culinary treasure is add rice noodles and top with sliced tofu, your choice of vegetables. A hearty Italian classic loaded with tomatoes, ditalini pasta, kidney beans, spinach, green beans, and zucchini simmered in a rich vegetable stock seasoned with sweet roasted garlic and basil, and finished with a drizzle of olive oil. ServSafe is the most recognized name in food safety and certification. The ServSafe Food Safety Manager Certification class is an 8-hour program that reviews the basics of food safety and sanitation. The class includes an accredited examination. Upon successful completion of the exam, students will receive a certificate. This certificate is valid in the State of California for 3 years and meets all requirements of AB 1978 and will keep your business in compliance with State and Federal Law. In order to receive your materials in a timely manner, you must register at least two weeks prior to class. It is your responsibility to read the textbook prior to class. As a U.S. Foodservice customer, this class is being offered to you at the discounted rate of $95 per person and includes class instruction, textbook and exam with exam sheet and certificate. If you are not a U.S. Foodservice customer but are a member of the California Restaurant Association, you may register for $125 per person. Non-customers/ non-members may attend the class for $170 per person. Both the textbook and the exam are available in English and Spanish, however the class is only taught in English. Please specify on your registration form if you would like your materials in Spanish. Mr. Wilson at 1-800-953-3822, or you may send an email to him at: mrfoodsafety@aol.com. 2-WEEKS in advance of the class date! Cancellations made less than 7 days prior to seminar date and class date transfers will be charged an additional $10. Shipping Fees for registrations forms received less than 2 weeks prior to the class date will be charged an additional $20 for overnight shipping. This is to ensure that you have your materials PRIOR to the class. If you are not a U.S. Foodservice customer, would you like to be contacted by a representative? Forget the egg and grapefruit diet, new research shows you could lose 2lb a month just by eating eggs for breakfast. Going to work on a couple of eggs might be the way forward if you want to shift those pounds. According to new research from the Rochester Centre for Obesity in America, eating eggs for breakfast could help to limit your calorie intake throughout the rest of the day, by more than 400 calories. In the study, 30 overweight or obese women ate either an egg-based breakfast (2 eggs) or a bagel-based breakfast, containing the same amount of calories and almost identical levels of protein. The researchers recorded the women’s eating habits and found that just before lunch, the women who had eaten eggs for breakfast felt less hungry and ate a smaller lunch as a result. Better still, over the next 36 hours the group eating the egg-containing breakfast consumed, on average, 417 calories less than the bagel-eating group. This study suggests that eating eggs for breakfast makes you feel fuller for longer so that you eat less at your next few meals. This is great news if you’re trying to lose weight as it means you may find it easier to cut calories without feeling hungry. In fact, based on these results you could expect to lose up to 2lb a month, simply by eating eggs for breakfast! Eggs are packed with a variety of nutrients including protein, zinc, iron and vitamins A, D, E and B12, but contain just 85 calories each. Old advice to limit eggs to just a few each week has also been abandoned. According to the Food Standards Agency, there’s now no limit to the number of eggs you can eat in a week as part of a healthy balanced diet. If you fancy starting the day with eggs we suggest you avoid frying them and combine them with whole meal toast and a glass of vitamin C-rich unsweetened orange juice, which will help the body make the best use of the iron in the eggs. Sharing Italian culture and San Marzano tomato flavor with the North American continent are our founding principles. In partnership with the tomato growers of Campania and our production plants, Carmelina ‘e… San Marzano® Tomatoes made their first appearance in the United States in February 1996. 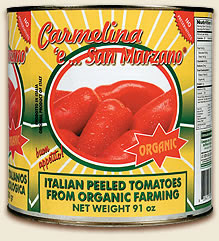 All Carmelina Brands® products are produced in the region of Campania; Italy’s tomato heartland. Our production plants are in Scafati and Nocera Inferiore, Italy approximately 45 kilometers southeast of Naples and 20 kilometers northwest of Salerno. The pack season for our products runs from late July through September annually with over 200 people employed at the peak of the season. Our production plants are HACCP certified and ISO 9001 registered. Click and take a tour of the Carmelina Production. A History of... "Only the Finest"
In the mid 1940s, an enterprising young Philadelphian named Martin Dabrow became America's very first importer and distributor of high quality foods sold directly to supermarkets. By the 1950s, Martin was still importing some products, but he began using local manufacturers to produce some dressings and sauces here in America. A real stickler for quality, Martin kept a watchful eye on their kitchens. He soon concluded he could make the products even better if he made them himself. So, in 1965, Martin used his life savings to purchase a food plant in Philadelphia. He named it "Chelten House" in honor of a handsome home he admired in his childhood neighborhood. Martin's reputation for quality spread quickly. Before long, hundreds of supermarkets and restaurants were asking him to manufacture sauces and salad dressings they could use and sell under their own name. It wasn't long before Chelten House had outgrown its Philadelphia location and moved to a new, larger facility in Pennsauken, New Jersey. Under Martin's son, Alan Dabrow, the new manufacturing company became even more successful. So much so that, in 1979, Chelten House ceased all importing to focus solely on manufacturing its own food products. The mission statement "Only the Finest" never changed and the company's thrust into upscale dressings, sauces and marinades continued. The third generation of Dabrows, Steve and Cheryl, joined the business in the early 1980s. Again, the need to expand presented Chelten House with the opportunity to build a larger, more modern facility. In 1987, Chelten House initiated production in its current plant in the rural Jersey farmlands. Steve and Alan designed the new facility to maintain its emphasis on small batches, which enabled our products to retain that "homemade" flavor and texture. Years later, a redesign of the processing area, incorporating the newest technology including computerized batch making system, helps keep Chelten House out in front of the competition. In the early 1990s, Steve steered the company into the all-natural and organic arena. Chelten House scoured the country to find vendors who could supply them with certified organic ingredients needed to create great tasting products. Today, Chelten House is the undisputed leader in the manufacture of natural and organic salad dressings, pasta sauces, salsas and marinades. The family has declared that no preservatives or additives will be used in the processing of any products under the Chelten House, Marinade Bay or Simply Natural labels. 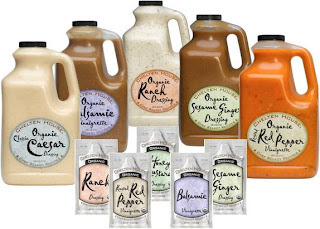 You can find Chelten House dressings at US Foodservice San Francisco. The modern-day garden pea, from which dried peas are made, is thought to have originated from the field pea that was native to central Asia and Europe. Dried peas have been consumed since prehistoric times with fossilized remains being found at archaeological sites in Swiss lake villages. Peas are mentioned in the Bible and were prized by the ancient civilizations of Egypt, Greece and Rome. For millennia, dried peas were the main way that people consumed this legume. It was not until the 16th century when cultivation techniques created more tender varieties of garden peas that people began to consume peas in their fresh state as opposed to just eating dried peas. It seems that the Chinese, a culture that had consumed this legume as far back as 2,000 BC, were the first ones to consume both the seeds and the pods as a vegetable. Peas were introduced into United States soon after the colonists first settled in this country. In the 19th century during the early developments of the study of genetics, peas played an important role. The monk and botanist, Gregor Mendel used peas in his plant breeding experiments. Brown bacon, add leeks, onions, and carrots until softened. Add garlic until it becomes fragrant. Add broth, split peas, bay leaf, rosemary and curry. This weekend I pulled the last of my summer garden up and reworked the soil for some winter garden peas and sweet peas that I am going to plant. The only plant left in this flat is my parsley, that was almost completely covered by my zucchini squash until yesterday. We are currently in a very volatile market in the dry grocery arena. As many of you have heard or read, climate, demand, growing/processing costs, freight costs, and the weakening dollar are impacting the food market. This update is to keep you informed as to the causes of the price increases that you are seeing or will be seeing in the future. The tomato crop avoided the weather catastrophe of 2006, however, the growers demanded an increase of $5 per ton to cover growing costs. Water, labor, fuel all contributed to those costs. Once the tomatoes reached the canner, costs for processing, water, labor, ingredients, cans, label, fiber etc. impacted costs as well. Some tomato items increases were from .50 per case to $2.00 per case. The pineapple market is in dire straits due to a world wide shortage of pineapple. Supplies are tight and prices are firm. We continue to buy ahead in order to supply our customers. The peach market and fruit cocktail market have seen some softening since the crop came in. Mother Nature was kind to the fruit crop and blooms yielded good fruit in sizing and color. The apple crop is facing the same circumstances as some of the other commodities. Weather has impacted apple sizing causing more apples to be used to create the end product. The demand in the fresh market is also straining the processed market. The Midwest and the Northwest are experiencing the same issues. The crop is down 15% from prior year and cost increases that will be passed down in the next month to the industry are over 25% and inventories will be low. This is not the time to take on any new processed apple customers. The dry bean contracts for next year have been finalized. The crops were favorable, however, less acreage was planted thus yielding a smaller crop. Hence, prices are on the upswing for next year. We have procured 3 truckloads of pintos that will hold us on pricing through the end of the year. The bushel price that is the key component in flour pricing has been impacted by the following three things. The weak U. S. dollar has caused an increase in exports straining domestic supplies. The weather has negatively impacted the winter and spring harvests. The push for ethanol has caused more wheat acreage to be converted to corn acreage thus decreasing supply. The market remains strong and shows no sign of decreasing. We have been notified of increases in the neighborhood of .10/lb for the month of November and going forward. This price increase follows at least two others that have happened recently. This, again, is due to the wheat market conditions listed above. Due to the drought in the southeast states, which is the primary growing region for peanuts, most inventories have been depleted. Supplies will be tight and prices high into the first half of next year. Corn oil faces the same pricing issues as more corn is converted to ethanol. All oils have trended up and stabilized on the high side. Rice is facing a price increase in December due to the increase in processing costs and freight. Basic American will be taking a price increase in December due to the potato crop being the lowest yield in 15 years. This year’s crop follows a short crop from last 2 years putting pressure on prices due to the lack of carryover. From the farm to the consumer, the dairy world is changing rapidly. We are seeing conditions we’ve never seen before, which has caused the markets to be on an upward trend.  US demand is outpacing milk growth.  Grain prices are skyrocketing due to global shortages. Weather has depleted global reserves. Drought conditions in Australia and other parts of the world have really put a strain on the cost of feed. In addition, over 160 corn ethanol facilities have popped up in the US, pulling feed from the dairy industry.  US dairy exports are up 27% because the dollar value is weak which is driving foreign buyers to shop in the US. This is increasing domestic prices.  China consumption is up 12% and their milk powder sales are up 176%. With limited resources and the country becoming more westernized, this forces them to seek dairy products outside China.  European subsidies have been suspended, again making our dairy products very appealing from a price standpoint.  Of greater concern is the potential shortfall in cheese supply by 2010 due to the fact that many cheese manufacturers are moving away from cheese. o Manufacturers are taking big hits in cost increases such as fuel/freight, packaging, healthcare, utilities, etc. o Manufacturers are finding it more profitable to produce milk powders, etc. where the market price for these items due to global conditions have skyrocketed. As of October 26th Domestic Cheese has closed down, they were bought by Tony’s Fine Foods of Sacramento. Tony’s has decided not to continue to carry the Molinari line of fine products on a weekly basis Domestic Cheese used to buy 4 pallets per week. That translates to 4000-6000 lbs of Molinari products that are not out on the streets. Founded in 1896, Molinari & Sons has carried on the traditional Italian art of sausage-making in the cool climate of San Francisco. Through four generations, the Molinari family has provided Americans with the finest in salamis and Italian sausages of all types. As a family-owned business, P.G. Molinari and Sons continues the tradition of quality products and service. Fourteen year old P.G. Molinari arrived in San Francisco in 1884, an immigrant from the Piedmont region of Italy. He went to work in the first salami factory established in San Francisco, A Chiesa, where he became a foreman. He opened his first store in 1896. P.G. 's son Frank entered the business as a partner after WWI, and his brother Angelo joined his father and brother a few years later. After P.G. retired in 1950, Frank's son in law, Peter Giorgi, joined the business. And in 1978 P.G. 's great grandson Frank Giorgi entered the business after graduation from the University of California, Berkeley. The 1962 move from North Beach to 1401 Yosemite Street allowed Molinari & Sons to expand and improve their manufacturing capabilities with larger drying rooms and freezer facilities. The traditional art of salami manufacturing has been maintained at Molinari, even though the technology has been modernized and changed. While the Molinari Company has expanded and manufacturing processes have been modernized, the company's commitment to it's traditional products has ensured that it's reputation for quality has remained consistent throughout the years. Their manufacturing process is meticulous. Every product goes through a step by step process that has been proven through centuries of tradition. They use only the best quality beef and pork cuts available to manufacture our products and it shows. 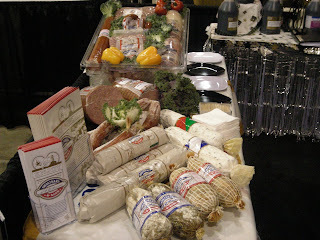 US Foodservice of San Francisco carries in stock 7 Molinari products with another 12 items available with advance order. Friday 1:00 pm cut off for Monday deliveries. 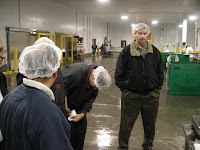 The tour began around 10am at the Lusamerica Foods processing plant in Morgan Hill. On hand were Center of the Plate Specialists Brian Meier, Rich Bravo, and Steven Salle, Seafood buyer Brian Flaherty,and Brian Isaeff, Territory Manager US Foodservice San Francisco. The hosts were Jonathon Frederico and Tim DeCaminada. 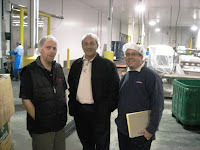 Lusamerica Foods was founded in 1975. 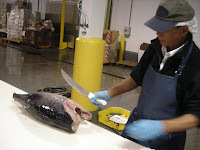 Initially, a small importer of specialty foods, Lusamerica slowly evolved into the seafood distribution industry. From its humble beginnings in the mid 70’s, Lusamerica grew steadily, relying on scarce financial resources and the dedication and perseverance of a handful of extremely dedicated employees. Lusamerica out-hustled the competition by combing the piers, in the early morning hours, looking for the freshest available seafood in order to provide superior quality, service and price. Today, much has changed in the industry, but the same principles of quality, price and service established in those early days, still drive the organization today. Lusamerica now features a full line of fresh and frozen products, acquired locally and flown daily from all over the world, 6 days a week delivery service and 7 days a week sales office support. With over 40 trucks, tractors, and trailers, equipped with the latest in refrigeration technology that blankets the entire bay area and beyond, Lusamerica is able to expeditiously respond to its customer’s needs. 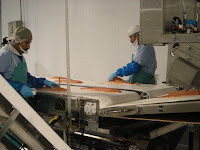 Lusamerica also maintains a comprehensive food safety program, that is independently monitored and certified, in order to provide a wholesome product of superior quality. 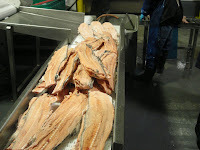 Lusamerica has built the necessary infrastructures, based on superior service, and is now poised to maintain and enhance its position in the industry as the "Ultimate in Quality Seafood"
For as much business as Lusamerica Seafood does in the Bay Area it is surprisingly slim on automation. as the filets are run into the mechanical deboner that removes the majority of the bones. On the other side the filets undergo scrutiny, particularly around the collar for final hand-removal of the collar bones. to two hours the carcasses are frozen solid in blocks, packed, and ready to ship for export to Asia. Back at the filet line, processors pack the finished fillets in poly bags which are then weighed. Weight, origin, processing date, and shipping tags are created at this point. The tags follow the fish for the remainder of their trip to their final destination. 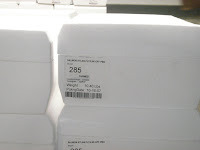 For the US Foodservice San Francisco seafood program the filets are packed in the poly bag, then in insulated foam boxes packed with gel packs rather than ice to protect the quality of the product. The labels are affixed to the outside of the box for easy identification and quality control. One of the challenges we encounter in the seafood sales business is identifying the crossroads of “Yield and Price”. Jonathon had one of his 30 some year employees d emonstrate the different trim yields of a salmon filet. Starting with a whole fish, he took us from an “A” Trim to an “E” Trim. If you had this man on staff I would recommend purchasing whole fish and letting him process them, otherwise take a look at our portion cut program. 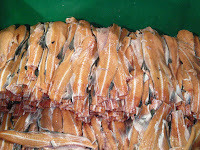 Portion are all hand cut, weighed, and packaged for foodservice customers. 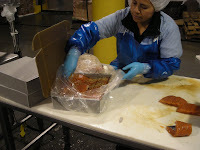 We recieved a demonstration of various types of cuts, a block cut, bias cut, watched the marinated and portioned filets. 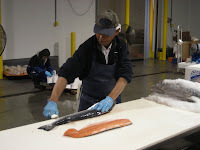 When not processing for the US Foodservice Fresh Seafood Program Jonathon has crews work evenings putting up orders for the retail grocery and retail seafood markets. While the majority of the processing is done by hand, Jonathon demonstrated their retail packaging machine that seals, weighs, prices, and labels the finished filets for various grocery stores.